At the end of four years in office, how does Prime Minister Narendra Modi's report card look like? He took charge when the economy was pretty much in the doldrums, and took a series of decisive steps over the next four years. He made a great many announcements, and some of his ministries did significant work. Two major economic laws were passed while one risky experiment was conducted with very little planning. In the first three years, Lady Luck also smiled on him - crude oil prices, which stood at over $100 a barrel in 2014 when he took charge, started falling sharply soon after, giving him an unexpected financial bonanza. 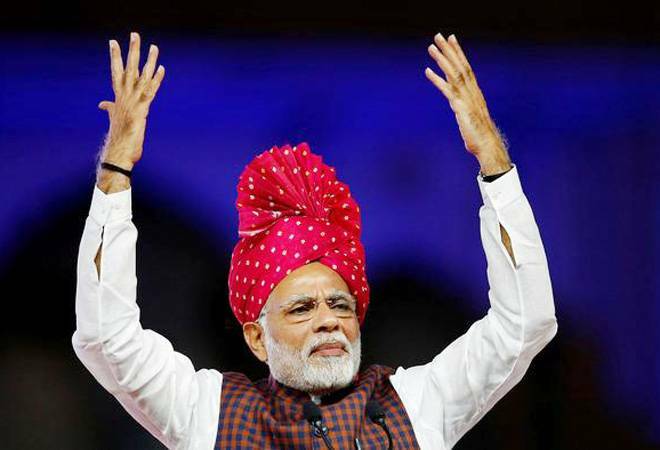 But as he enters the final year of the government's term, he is probably facing as many - if not more - economic problems as he did when he took charge. In fact, one would say if the BJP returns to power, Prime Minister Modi will have to work even harder than he did in his first term to keep the economy on an even keel. The problem with most assessments of Modi's four years in office is that the political issues tend to overshadow the economic ones. But the economic steps taken by his government were also significant and some of them will have a long-term impact. I would say that the two most important laws the government had passed in these four years were the Insolvency and Bankruptcy Code (IBC) and the Goods and Services Tax (GST). While IBC will have a far-reaching impact on corporate bankruptcy resolution, GST is still a work in progress, but it is the biggest tax reform since, perhaps, Independence. Both IBC and GST have problems, but these will settle down. A year or two down the line, the real benefits will start showing. There are other notable achievements. The pace of infrastructure development, especially road building, has been significant. The power sector, too, has seen production ramp up and an effort to sort out the problems of the state distribution companies through Ujwal DISCOM Assurance Yojana, or UDAY. Also, there has been significant progress on the solar energy front. The runaway inflation that the government inherited has been tamed. The fiscal deficit was firmly brought under control but not perhaps to the full extent that the government would have liked. The last two were helped by cooling crude oil prices, but the government took full advantage of it. The flipside is that there were as many economic missteps by the government as successes. Demonetisation was a whimsical experiment, and despite all the apologists of the government, it is hard to see what could justify such a big step. At any rate, it did not achieve any of the goals that the Prime Minister had mentioned while announcing it. Then, in the first two years, the government paid little attention to agriculture or rural distress even though the country saw two bad monsoons and they led to unprecedented problems. While the government is trying to make amends now, the efforts are too little and too late in the day. Rural wages remain stagnant, and farmers' distress has not reduced. The government also announced an ambitious Make in India plan, but the country has not become a manufacturing powerhouse in any industry segment. This also shows up in our dismal export performance over the past four years. Defence manufacturing is another area where the government made ambitious announcements, but they have not picked up due to procurement policy issues. Finally, although the Prime Minister has personally charmed many global leaders, it has not led to any major economic benefit for the country. Even the US, where Modi's trips have been major successes, has turned against Indian exports. China has paid lip service to Indian worries about dumping but has not taken any substantive step to address the balance of trade. Even the EU remains a difficult market, and all these show up in our lacklustre export figures. The trade problems are particularly worrying. Initially, exports fell because crude oil prices were dropping and a major chunk of Indian exports includes refined petroleum products. Although exports started picking up last year, we are still below what we used to export in 2014 despite robust world trade growth over the past few years. As mentioned earlier, India's merchandise exports are not what a fast-growing country needs. Moreover, in spite of attracting a lot of FDI, the Modi government has failed to enthuse the private sector into setting up greenfield projects. Much of the investment - both foreign and domestic - has come for buying existing assets. In turn, this has led to dismal job creation. Now foreign inflows are slowing down and in some months, also turning negative. In the last two years, corporate performance was also fairly lacklustre with a large number of companies struggling under debt. Meanwhile, banks are still trying to clean up the NPA mess that tripled since 2014. As the current Modi government enters its final year, economic worries are growing once again. Inflation, though still low, is hardening. Crude oil prices have hit $80. The current account deficit is rising again. And a technology revolution upturning the entire industry, large-scale job creation is going to be difficult. True, many of the numbers now seem much better than they did in 2014. But the favourable tailwinds have reversed direction and the going can be expected to be tough from here on. "Make in India still has a long way to go"